The South Sudan government has written to their Kenyan counterparts seeking permission to have former army chief of staff, General Paul Malong Awan deported to the capital, Juba. The foreign affairs minister, in a January 5 letter, said Awan was permitted to go for treatment and stay with his family in Nairobi, but is allegedly now involved in activities undermining stability of the young nation. “The South Sudanese government after a long discussion with the members of the international community and elders from Dinka community decided to release Gen Awan on health grounds. Your Excellency, the decision was to allow the general to visit your country for medication and to visit his family but despite assurance from the general himself in the matter of the state, the national security agency of South Sudan through a letter from General Akol Koor, Director General, has shown that General Malong is engaging in activities undermining security in South Sudan”, partly reads the letter, which bears the signature of the minster, Deng Alor Kuol. The minister said indisputable evidence provided by national security agents implicated Awan in the recent attacks in Juba and Wau. “We appeal to your government to revoke his visa and repatriate him back to Juba”. The foreign minister said Awan was placed under house arrest in Juba on suspicion of planning to stage a coup in 2017 against the coalition government under President Salva Kiir,” further reads the letter. Awan was sacked in May 2017, but his attempt to relocate to his home town of Aweil was blocked after his convoy was intercepted and stopped at Yirol, the administrative headquarters of Eastern Lakes and he was persuaded by elders to return to Juba. He was later placed under house arrest, but released in November 2017 to seek medical treatment in Kenya after series of negotiations involving community leaders after several days of a standoff. 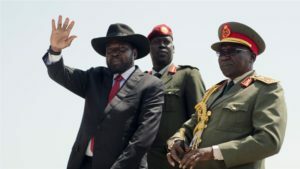 In January, the government released videotapes carrying his voices talking to some of his associates in the army to attack some areas, including Aweil, Madhol, Wau and Juba, the capital of the country. He denied the authenticity of the tapes despite some of his associates taking to the bush in what many believe was in fulfillment of discussions with them, either through phone calls or other means. Awan said he would not return to Juba because his safety was not guaranteed.